Are alert and wary animals as well as impressive and beautiful creatures. Collared lizards may bite, but, despite their wariness, captive collared lizards can become quite tame with gentle, slow and persistent overtures. They can and will often climb confidently into your hand and up your arm. They do not, however, enjoy being physically restrained. 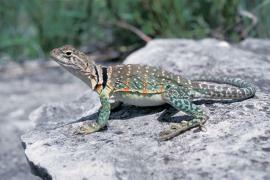 In one or another of several poorly differentiated races, the eastern collared lizards range westward from eastern Missouri and central Texas to California, and deeply southward into Mexico. Once considered iguanids, collared lizards are now contained in their own small family, the Crotaphytidae and are known scientifically as Crotaphytus collaris ssp. Longevity is not reported, but with proper husbandry a life span of more than 5 years should be attainable. Collared lizards are full-grown at about a foot in length, of which two-thirds is tail length. Collectively, they are big headed and pudgy bodied. They have long, strong, hind limbs and when startled often run bipedally with forequarters held well off of the ground. Males tend to have a greenish coloration (at least during the breeding season). The legs are often a brighter green than the body. The back and sides are often peppered with light spots. Except when they are gravid (carrying eggs), females are usually paler than males. Gravid females usually develop spots and bars of bright orange on their sides. Both sexes sport a pair of black collars. Collared lizards are clad in smooth, granular scales. The belly is much lighter in color than the back. There are usually dark spots on the back. The lips are pale and there is at least an indication of a light stripe along each side of the back. The throat is light. The tail is dark banded. The eastern collared lizard and its subspecies (the western, the Chihuahuan, and the yellow-headed collared lizards) are alert and wary. If approached, the collared lizard will quickly dart beneath the boulder on which it is sitting, or run rapidly (and often bipedally) into nearby long grasses or shrubs. While basking it may curl its tail laterally. When running, the long tail extends straight in back of the lizard as a balance. With gentle, slow and persistent overtures, captives can become quite tame and will often climb confidently into your hand and up your arm. They do not, however, enjoy being physically restrained. Although the collared lizard can climb, they are far more at home among boulders or terrestrially than in a shrub. Collared lizards are often quite abundant in boulder fields or in areas of construction rubble. Low terrarium humidity is most suitable for collared lizards. Keeping these lizards in the humid southeast or in fog-belt regions can be challenging. When optimally warmed, collared lizards are alert and active. The minimum floor space for one or a pair should be 18 by 36 inches, about that supplied by a 40-gallon tank. Larger would be fully utilized by the lizards. If you have three or more lizards a 75-gallon tank should be provided. Carefully stacked rocks (be sure these can't shift or topple and trap, injure or kill your lizards) and a sandy substrate are fine. Collared lizards enjoy basking and often ascend to the highest point (the best vantage point) to do so. Basking spot, preferably on a flat rock, with a surface temperature of 98 to 110 degrees Fahrenheit should be provided. Key this to the natural photo period in yur area. The remainder of the cage can be in the high 70s to mid 80s. Nighttime temperatures can be a little cooler and, of course, the basking light is turned off. A shallow dish of fresh water must always be available. In captivity, eastern collared lizards will eat roaches, crickets, mealworms, king mealworms and silkworms. They may also eat an occasional blossom. And, as predatory creatures thewill also consume small vertebrates such as other lizards and ground snakes if they are hungry. Although some collared lizards may occasionally accept a newly born mouse, the very high fat content of baby lab mice makes them a poor choice for a steady diet. Provide these only as a treat (not more than one pinky mouse weekly or biweekly). A shallow dish of fresh drinking water should always be present. Any creature with teeth can bite, and until acclimated, a collared lizard is quite apt to do so. The lizard's head is large, its jaws are powerful, and the bite can be painful. The claws are sharp, but small. Long-term captives often become accustomed to careful handling and do not bite. The least traumatic way of taming a lizard is to first accustom it to being fed by hand. Offer your collared lizard a king mealworm or cricket, first from forceps, then, as it becomes accustomed to this, from your fingertips. Will regenerate but never perfectly. Collared lizards are quite hardy. However, they must be kept very warm and they thrive best when terrarium humidity is low. Unless these parameters are met, they may refuse food, or not consume enough to sustain themselves. Collared lizards can actually tolerate a basking spot with a surface temperature of up to 115 F with no ill effects. Dry warmth is critical to their survival.